Liverpool fell silent for a minute to mark the 30th anniversary of the Hillsborough disaster. 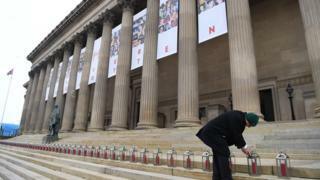 Ninety-six lanterns were lit on Monday morning on the steps of St George’s Hall in tribute to those who died. Banners with images of the 96 Liverpool fans killed by the crush at an FA Cup game have also been hung at the hall. A minute’s silence was held across the city at 15:06 – the time the 1989 semi-final between Liverpool and Nottingham Forest was stopped. The bells of the Town Hall tolled 96 times following the silence while flags on civic buildings were flown at half mast. City mayor Joe Anderson and Lord Mayor, councillor Christine Banks, laid wreaths in front of the lanterns to begin the day of remembrance. Speaking outside St George’s Hall earlier, Louise Brookes, whose brother, Andrew, died in the disaster, said: “Andrew has been dead now four years longer than he was alive. On Monday morning Liverpool’s first team squad paid its respects at Anfield while Liverpool FC chief executive Peter Moore and members of the club’s women’s team placed wreaths at the Hillsborough memorial. Club chaplain Rev Bill Bygroves conducted a brief service with members of the under 23 squad. He posted a picture of the Hillsborough memorial on Instagram with the caption “Never forgotten”. A memorial service was held at Liverpool Cathedral and The Kop has been opened for people who want to sit and reflect.